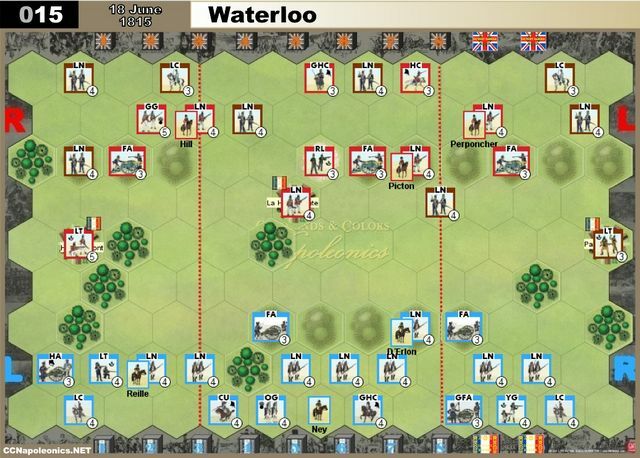 If you follow me on Twitter (@mandmpodcast) you would have seen that Dave Luff and I refought Waterloo last night using the Commands & Colors: Napoleonics boardgame. Over the last couple of weeks, we have fought the battles of Quatre Bras and Ligny using the C&C:N rules, all in preparation for the final showdown of Waterloo (Thursday’s is our usual gaming night – the opportunity to refight Waterloo on the actuall 200th Anniversary was simply too good to miss). 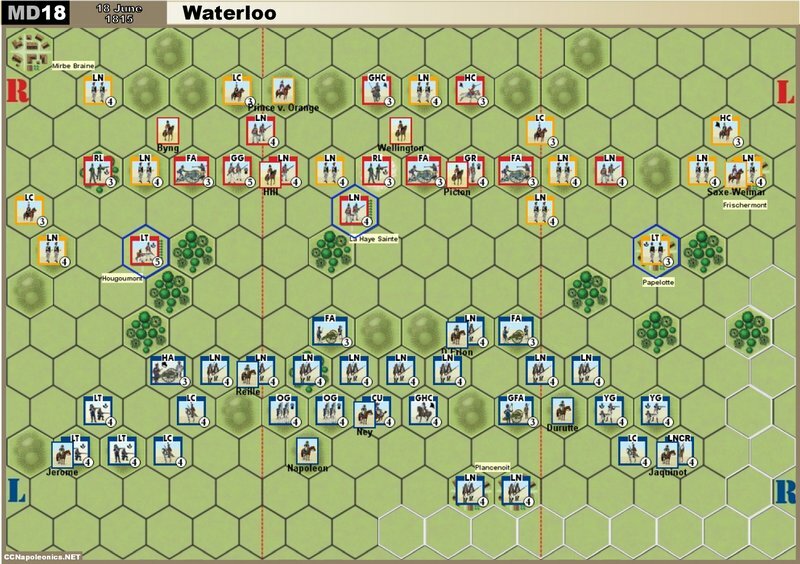 The ‘Official’ GMT Scenario for Waterloo is actually pretty limited. As you can see, the action is very much focused on the centre of the battle, with Hougemont and Papelotte at the extreme flanks. Also, the Prussians do not play a part in this game. And indeed, looked good on the table. I queried with Dave whether we should use this or not – we both decided that we should ‘go large’ with this battle – bigger is better, isn’t it? OK, we had a few issues with troop deployment and missing units on the Allied side – but you could definitely tell what battle you were fighting, and the extra depth of the board gave a nice ‘grand scale’ to the whole thing – so much so that I’d consider converting all the C&C:N scenarios to this format. Our original thought was that their deployment zone was incorrect, and that they arrived too far to the rear of the French army. However, that was the least of the worries. The Prussians turn up after a random number of turns, based on rolling the dice. This is a minimum of four turns, and an average of between 8 and 12. They potentially turn up very quickly, but it encourages the French played to ‘get on with it’ – except that it doesn’t. The problem? The victory conditions for the French player do not change when the Prussians arrive. At the start of the game, either side has to achieve 12 victory banners. The arrival of an additional 12 Prussian units effectively give the French extra targets to engage – indeed, in our game last night a third of my victory banners came from defeating Prussian units. It would seem to make sense that the arrival of an extra force would subsequently increase the French victory requirements – after all, they are fighting a force that has grown by 25%, so an extra 25% should be added to their victory conditions, yes? As it was. the arrival of the Prussians actually helped the French win the battle. Other than an exchange of artillery fire (which had accounted for a couple of unit casualties in either side) and the charge of Ney’s cavalry, the French centre had hardly moved – indeed, D’erlon was killed by artillery fire having not changed position from his initial deployment all game. All the fighting had taken place on the flanks – on the French left around Hougement, and on the French right against the Prussians. 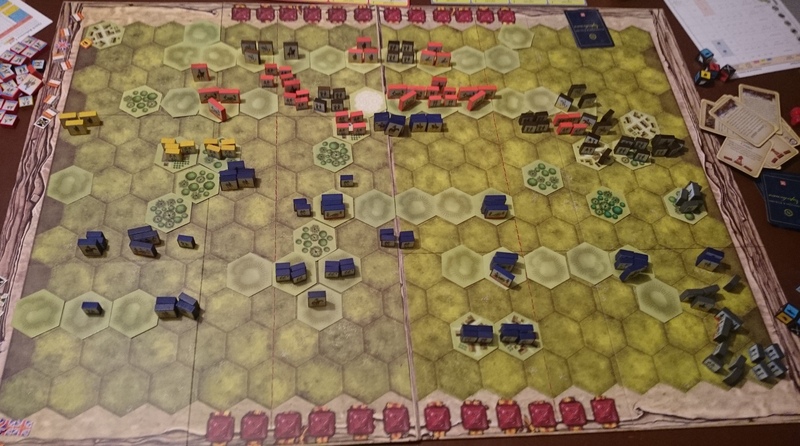 The French were still outnumbered 3:2, and the road to Brussels was still blocked by British Infantry, and yet according to the scenario rules they won the battle. Admittedly, the French Artillery had managed to kill Wellington, so some would justify this act alone as worthy of victory. However, our discussions during and after the game left us with the impression that although the scenario looked good, it was still in need of some major work to resolve several issues with Prussian deployment, lines of retreat and victory conditions. Would we have had a better time playing the smaller scenario? Quite possibly. However, once again it has highlighted that creating scenarios is all well and good, but they need to be thoroughly play-tested. So, a victory for the French at Waterloo – but one that seemed, on reflection, somewhat hollow. Nice try – but it also shows up how limiting C&C can be when a playthrough bears no resemblance to the actual events of the battle. The cards can really stymie any player from replicating the most important episodes of the real thing. Not yet played any incarnation of C&C. I keep thinking of maybe dabbling in the ancients, but at heart I am a ’39 onwards gamer. If I bought it would I play it? Don’t know. Nice looking set up though. Is that a homemade board? Nice looking game there Neil and interesting to see the French won, me and my club mates had are Waterloo refight today using Black Powder rules and 1/72nd/20mm figures (some pictures on my blog http://lurkusspleen.wordpress.com/ if your interested ), we also finished with a French victory ;o).